Husbands, sons and fathers: since Mother’s Day is coming up, this may be a super easy yet wonderful meal to make for the special ladies in your life! These vegan, dairy-free, egg-free and nut-free Yummy Vegan Raspberry Coconut Pancakes are light and fluffy, quick to make with only ten ingredients and require no special kitchen equipment. The pancakes can be made gluten-free too if you use a gluten-free flour such as a specialty gluten-free flour mix. I used unsweetened shredded coconut flakes, but you can use sweetened shredded coconut flakes if you want the pancakes slightly sweeter or add a drizzle of maple syrup on top of the pancakes. 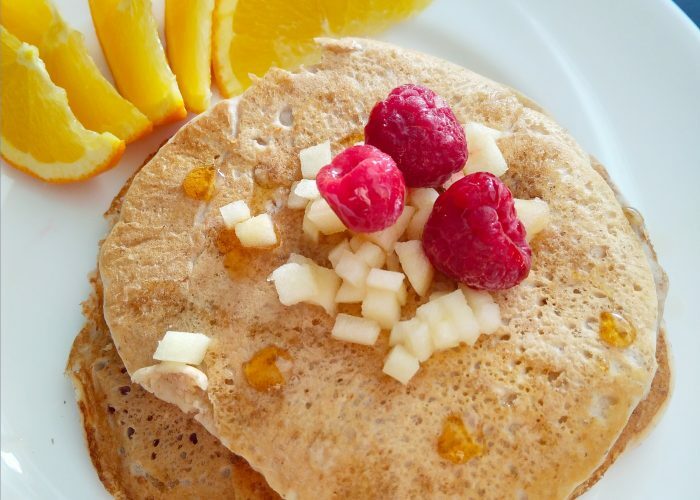 Alternatively, just add more fresh or frozen raspberries to the mix and then garnish the pancakes with diced fresh fruits like pears or apples to increase the sweetness factor. Canned diced fruit (canned in its own juice) like peaches, pears, apricots, pineapples or mandarin oranges would also work as a topping. Our family enjoyed these pancakes that New Year’s Day morning so now I’m excited to share this recipe with you. These pancakes taste great as leftovers and can be frozen too. Try them and see for yourself, and have fun making creative shapes to please adult and child palates! Delicious vegan, dairy-free, egg-free, nut-free pancakes that are simple to make but sure to delight all guests and family members. This recipe can be made gluten-free. Combine the dry ingredients well together (flours, sugar, baking powder, coconut flakes, salt) in a large mixing bowl. Whisk the oil, vanilla extract and fortified plant-based milk together in a separate bowl. Add the wet ingredients to the bowl with the dry ingredients and mix well until combined (it’s alright if there are some lumps remaining). It should be a thick pancake like batter consistency. If the batter is really too thick, add a little bit more plant-based milk (a tablespoon at a time) until a good pancake batter consistency is formed. Add in the 2 tablespoons of raspberries (use more if you like). Heat a pan on medium heat until hot. Add a dollop of the batter to the pan and tilt the pan gently around to spread out the batter. Once bubbles appear on the pancake batter in the pan and the edges of the pancake appear dry, use a spatula to flip the pancake. Serve warm with desired toppings! You may substitute the all purpose flour and whole wheat flour with a gluten-free flour (like a specialty gluten-free flour mix) for a total of 2 ½ cups (or 392 grams) to make these pancakes gluten-free. However, you may need to add a little bit more plant-based milk (add a tablespoon at a time) to the mixture if the batter thickens up too much. For more of a 'coconut flavor' in this recipe, use fortified original flavored coconut milk beverage and coconut oil in this recipe, instead of the soy milk and canola oil in this recipe. You can put less oil into this recipe if you like, but the added oil helps to make the pancakes not stick so easily to the pan when cooking (I did not use a non-stick pan). Alternatively, you could lightly oil or grease a skillet if you find the pancake batter to be sticking to the pan itself when cooking. Wonderful recipe ! Love the addition of coconut in here ! !